The Government Accountability Office has determined that the U.S. DOT violated an anti-lobbying provision in the Financial Services and General Government Appropriations Act, 2017, when it “retweeted” and “liked” a tweet urging followers to “[t]ell Congress to pass” pending legislation. Although DOT was not the author of the tweet, DOT, by retweeting and liking it, not only endorsed the message, but also created agency content. Because DOT obligated and expended appropriated funds in violation of a statutory prohibition, DOT also violated the Antideficiency Act. On July 12, 2017, DOT, through its Smarter Skies Twitter account (@SmarterSkies), retweeted and liked a tweet originally posted on the @SteveForbesCEO Twitter account. The tweet stated: “We need to modernize air traffic control. Current system is 70 years old. Tell Congress to pass the [21st Century Aviation Innovation, Reform, and Reauthorization Act].” The tweet also included a hyperlink to the homepage for Citizens for On Time Flights, which, in turn, stated, “Tell Congress to support air traffic control reform!” and contained data fields for individuals to enter their contact information to send an auto-generated email to their Members of Congress. On July 13, 2017, DOT Office of General Counsel noticed the retweet on the Smarter Skies Twitter account and directed that it be removed immediately; a DOT official confirmed that the retweet was deleted within an hour of that instruction. IG Letter, at 7. However, on August 15, 2017, DOT IG discovered that the agency had not yet unliked the tweet. DOT IG explains that, although the like occurred on the @SteveForbesCEO Twitter feed, Twitter’s user interface allows a user to view all of the tweets that another account has liked, if he or she is logged into a Twitter account at the time he or she visits the account. 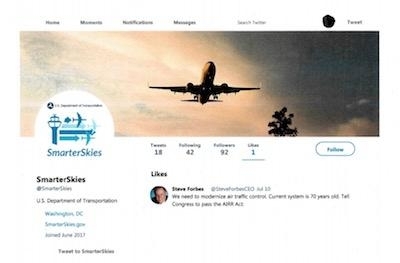 Consequently, as DOT IG explains, until the tweet was unliked, it was possible to see it by visiting the Smarter Skies Twitter account and clicking on the “Likes” tab. When DOT IG brought this to the department’s attention, DOT unliked the tweet. At issue here is whether DOT violated any statutory prohibitions on the use of its FY 2017 appropriations through its actions on the Smarter Skies Twitter account. One of the most fundamental statutes dealing with the use of appropriated funds is 31 U.S.C. § 1301(a): “Appropriations shall be applied only to the objects for which appropriations were made except as otherwise provided by law.” DOT’s appropriations are generally available for communicating with the public, and we agree with DOT’s view that its Smarter Skies Twitter account was designed to serve this purpose. Congress, however, has placed some limitations on Page 4 B-329368 agency communications. The key statutory limitation applicable agency communications. The key statutory limitation applicable to the retweet and like in question is the governmentwide anti-lobbying provision. The GAO concluded that the DOT violated the anti-lobbying provision in the Financial Services and General Government Appropriations Act, 2017, as a result of its Smarter Skies Twitter account’s retweet and like of a tweet that urged the public to contact Congress in support of pending legislation. Although DOT was not the author of the tweet, DOT, by retweeting and liking it, not only endorsed the message, but also created agency content. Because DOT obligated and expended appropriated funds in violation of a statutory prohibition, the agency also violated the Antideficiency Act. DOT should determine the cost associated with the prohibited conduct and report the violation as required by the Antideficiency Act.